Stephen Ganzberger was born on August 25th, 1924 in Wyandotte, MI. He grew up in Wyandotte, MI and enlisted in the Navy the day after his 18th birthday, August 26th, 1942, during World War II. He would see action in the Pacific Theater aboard two different LCI’s (Landing Craft Infantry) and be on active duty for 36 straight months. He served aboard the U.S.S. LCI (L) 329 [1942-1944], and also the U.S.S. LCI (G) 65 [1944-1945]. By war’s end, he had been awarded 4 medals, 3 battle stars, 2 campaign bars, 2 ribbons, the Philippine Presidential Unit Citation, the Insignia for the Amphibious Forces, and Honor Guard responsibilities. His WWII journey began on the LCI (L) 329 from in the southern Solomon Islands where he would see his first action of the war on Rendova Harbor, New Georgia Island. On the afternoon of July 4th, 1943, while his LCI Group was landing Army troops of the 169th Infantry onto the beaches of Rendova Island, sixteen Japanese Mitsubishi 97 bombers in attack formation bombed the Allied landing beaches. He shot down one of the twelve bombers that were eventually shot down by anti-aircraft fire. This action earned him his first Bronze Star. While on the LCI (L) 329, he would later land troops on the Russell Islands; New Georgia Island; Kolombangara; Vella Lavella; and Treausury Islands (Stirling), Bougainville. In January 1944 he transferred for duty aboard the U.S.S. LCI (L) 65. In June 1944, his LCI was converted from a Landing Craft to a Gunboat, being renamed LCI (G) 65. Aboard the 65, he would participate in the Morotai Island and the Philippines Campaigns. He would be involved in the Leyte Gulf, Philippines Campaign in October 1944. From his position in San Pedro Bay on the LCI (G) 65, he witnessed General Douglas MacArthur’s famous October 20th return landing on Red Beach, Leyte Island. On October 24th, 1944 at around 9am, a kamikaze pilot made a suicide crash dive into the stern of the LCI (G) 65, killing Stephen’s friend Lester Eugene “Paul” Aiston (SC3c). 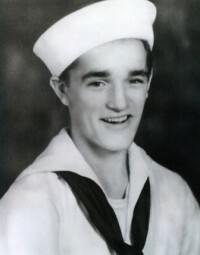 The action in Leyte Gulf would earn Stephen his second Bronze Star. His last action of the war was covering landings of the Sixth US Army on White Beach #1 and #2 in Lingayen Gulf, Luzon, Philippines on January 9th, 1945. He would be sent home four months later in May 1945 to recover from battle fatigue. He was later awarded a Silver Star because of an accumulation of all actions he performed during “Operation Cartwheel,” from Guadalcanal, to Bougainville, finally ending with the victory in Rabaul, New Britain. Stephen Ganzberger was honorably discharged as a Quartermaster 2nd Class from the Navy on August 15th, 1945. Upon returning to civilian life, Stephen Ganzberger worked as a sheet metal, heating and air conditioning mechanic for more than 50 years. He married his wife Patricia Ganzberger on April 28th, 1951, and they remained together for 60 years. They eventually had 6 children. When he retired, he became a licensed builder and a heating, ventilating and air conditioning contractor. He also served as liaison to the Capital Improvements Commission, where he provided input into the construction of City Hall, Police & Fire departments, and the courthouse. The World War II veteran and former Southgate councilman died on Friday, May 20, 2011. He was 86. In addition to his wife Patricia, he is survived by his children - Stephen, Michael, Patrick, Heidi, Victoria and Barrie; and his seven grandchildren - Eric, Kelly, Abigail, Zach, Patricia, Caroline, and Geoffrey. 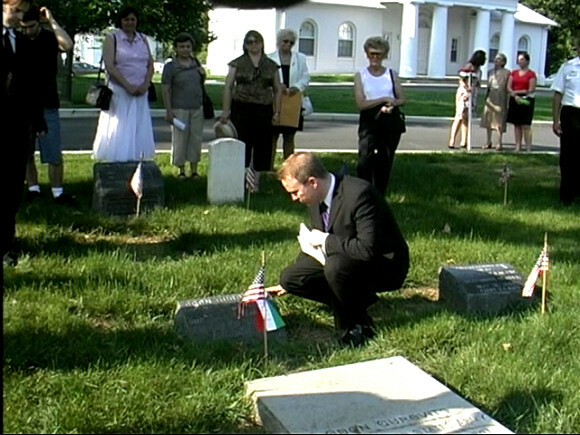 See below to learn more about the Hungarian Americans buried at Arlington National Cemetery. To see where some of these heroes are buried, [download the map]! 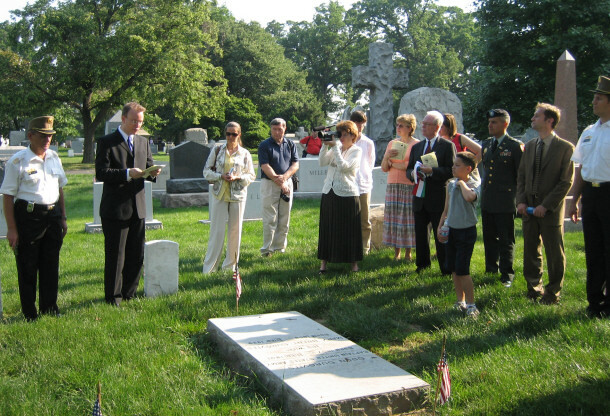 IF YOU KNOW additional Hungarian Americans buried in Arlington National, please contact us! Asbóth was a General in the Hungarian Army. Following the Hungarian democratic Revolt of 1848 against Austria, he followed Kossuth to the United States in 1851. He offered his services to the Union when the Civil War broke out. John C. Fremont appointed him a Brigadier General of Volunteers and chief-of-staff. Seriously wounded three times during the war, he was appointed to the rank of general in l864. At the Battle of Pea Ridge, Arkansas, he was wounded in the left arm. Despite the wound, he saddled up next morning. His arm was later shattered and a bullet lodged under his cheek in the Marianna engagement in Florida. In 1866, he was appointed U.S. Minister to Argentina and Uruguay. The wound in his cheek failed to heal, and on January 21, 1868, he died and was buried in Buenos Aires, Argentina. He finally came home on October 23, 1990 to full military honors at Arlington National Cemetery thanks to the Hungarian Freedom Fighters’ Federation. His grandson attended the funeral and is in the Virginia National Guard. Read more about him on Arlington Cemetery.net. Hussar in the 1848 war of independence. Escaped with Kossuth to the United States. Worked as a Journalist. At the outbreak of the Civil War, organized the 8th New York Volunteer Infantry becoming lieutenant-colonel. At the First Battle of Bull Run, 1861, he prevented Confederate forces from advancing on Washington. President Lincoln personally expressed his appreciation. Promoted to Colonel and shortly afterwards, received his star as a brigadier general. After Mosby's raid at Fairfax Court House, Lincoln summoned Stahel and ordered him to take charge of the cavalry at Fairfax and raised him to the rank of major general. 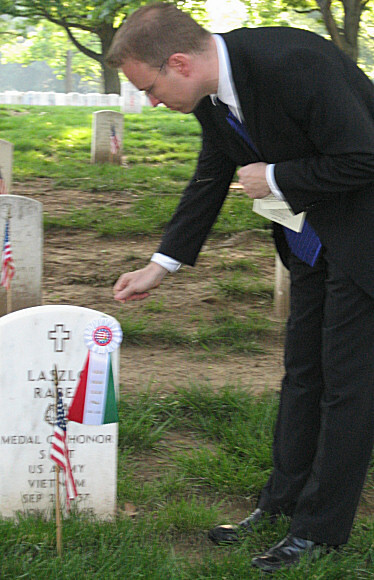 Stahel received the US Congressional Medal of Honor for his bravery at the Battle of Piedmont in Virginia. While wounded, the General led a cavalry charge which led to a Union victory. In 1866 President Andrew Johnson appointed Stahel consul in Japan where he succeeded in opening additional ports to American trade. In 1884 he was made consul in Shanghai, China. Laszlo earned the Medal of Honor in Vietnam while serving in the 173rd Airborne Brigade on November 13, 1968 “for conspicuous gallantry and intrepidity in action at the risk of his own life above and beyond the call of duty.“ He distinguished himself while serving as leader of Team Delta, 74th Infantry Detachment. Team Delta was in a defensive perimeter conducting reconnaissance of trail networks when enemy movement was detected. As he and a comrade prepared to clear the area, he heard an incoming grenade as it landed in the midst of the team's perimeter. With complete disregard for his own life, he threw himself on the grenade and, covering it with his body, received the complete impact of the immediate explosion. By gallantry at the cost of his life in the highest traditions of the military service, he has reflected great credit upon himself and the US Army. Captain Szekely distinguished himself by heroic actions on 11 September 1968, while serving as Commanding Officer with Company A, 1st Battalion, 5th Infantry near Ben Cui, Vietnam. His unit was established in its night location when they came under intense fire from a numerically superior enemy force. He immediately ran to the perimeter through heavy enemy fire in order to direct his men’s suppressive fire, braving fierce. With complete disregard for his own personal safety, he moved about the bullet swept area, and while engaging the enemy with his M-16 rifle, Captain Szekely was mortally wounded. His valorous actions contributed immeasurably to the successful completion of his mission and the defeat of the enemy force. He appears to be the only Hungarian American whose tombstone uses Hungarian accented characters. 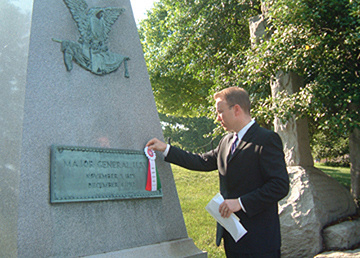 When competing for an appointment to West Point, Representative John R. Foley, Sixth Maryland District, reported his selection from the large number of finalists with this remark: “Akos Szekely…the most unique, special, and outstanding student I ever appointed to the United States Military Academy.” He would go on to rank near the top in all of his academic courses and graduated number five in his class on 3 June 1964, and has been recognized as the highest ranking graduate of Hungarian ancestry from any of the United States Service Academies. A preeminent textile pioneer and legend in the textile industry, fondly known as ''The King of the Mills.'' Born in Hungary and educated in Switzerland and England, he served in the US Army as a decorated veteran of the Pacific Theater. Born in Hungary in 1921, educated in Switzerland and England, served in the U.S. Army as a decorated veteran of the Pacific Theater. As former president of Collins and Aikman Decorative Fabrics, he presided over the world's leading fabric group. He joined Mastercraft in 1946, became president in 1960, assumed ownership in 1969, and is responsible for the company's meteoric rise, which today provides employment for 3,500 and sales in excess of $350 million. The recipient of numerous industry and civic awards, including the first Lifetime Leadership Award from Dupont in 1995, which embodied his creativity, devotion and legendary status in the industry. In 2002 he received ''The Trailblazer Award'' and was inducted into the American Furniture Hall of Fame. He will always be remembered for his wit, generosity and love of life. In lieu of flowers the family asked for contributions to the Andrew Major Scholarship Fund at Isothermal Community College, P.O. Box 804, 288 ICC Loop Road, Spindale, N.C. 28160. US Marine Corps. Served in Desert Storm. A weapons systems officer with 7 years service, he and the pilot were tragically lost on September 11, 2000 as a result of a mid-air collision between two F/A-18D Hornets near Yuma, Arizona. Seen here is AHF's Lt. Col. Steve Vekony saluting Maj. Ferencz. He served in the US Navy and was interred on 8/27/1975. He is buried with his wife, Emma. Born in the US, his parents (Louis John de Holczer and Sarolta Anna Klára Putnoky de Holczer) and two siblings (Lászlo and József) were born in Hungary. All became US citizens. Served with the US Army Air Corps. During WWII. Quartermaster 2nd Class Ganzberger enlisted in the Navy durign WWII in 1942, the day after his birthday. He would see action in the Pacific Theater aboard two different LCI’s (Landing Craft Infantry) and be on active duty for 36 straight months. By war’s end, he had been awarded 4 medals, 3 battle stars, 2 campaign bars, 2 ribbons, the Philippine Presidential Unit Citation, the Insignia for the Amphibious Forces, and Honor Guard responsibilities. Attila Zoltan Kovacs, was born in Mansfield, Ohi. He was the son of Lajos and Mary (Lakatos) Kovacs. He served with the United States Marine Corp, the Army National Guard and the United States Army. He was very patriotic but was also extremely proud of his Hungarian heritage. He is survived by his parents, Lajos and Mary Kovacs; a daughter, Rikki (Brent) Kovacs; a granddaughter, Brianna Briggs; two sisters, Klara (Mark) King and Maria (David) Leu; and numerous nieces, nephews and relatives in Hungary. 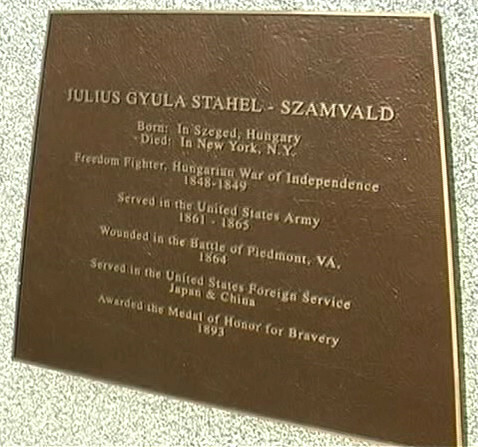 Did you know there are at least 9 Hungarian American recipients of the Congressional Medal of Honor? Read more about Maj. General Asboth and other Hungarian American Military Heroes on The Hungary Page's "Nobel Prize Winners and Famous Hungarians" Military Section.